There is a good large pontoon in the east side of Mitarai Port. As it closes to Mitarai historical townscape, it is good for your sightseeing. Toilet at Pavilion of Edo Period Port Town is one minute away in front of the pontoon. A public toilet in front of the pontoon has a large western style toilet. Another western style toilet is at Tourist Information Center. Every toilet at Mitarai is very clean. Water is available at the large toilet. Water is also available at a blue house in front of the pontoon. A guy at the house kindly advised me to use it. Provisions: A-COOP is 10 minutes away. Another shop near A-COOP has no fresh produce though, has variety of beers and liquors. A fuel stand is 6 minutes away seaside on the way to Ocho village. There is a restaurant in front of the pontoon, as well as some others. Most of them seemed to be open only weekends and holidays. The circumstances are same with last year’s. A-COOP shop for provisioning is 10 minutes walk away close by the river. It has meats, vegetables and others. Fishes were not so good. Local vegetables and fruits were very cheap. I came to hear to wait for the typhoon to pass. The circumstances are same with 2009. You may moor at the south side of the large pontoon. As the number of passenger boat services has been cut back, you may also moor at the other side. But, around 19:00, a passenger boat comes in. However, when they have no passenger, they don’t come in. I tried to moor my boat at a boat pool inside breakwaters and a pontoon at Ocho Village. The boat pool was too small to moor. The pontoon at Ocho had too strong tidal currents. Then, local people recommended me a pontoon in the east side of Mitarai Port. As it is close to Mitarai historical townscape, it is also better for sightseeing, they said. I had thought strong tidal currents would be there, because it faces Mitari Sound. But, locals said the current is not stronger than Ocho pontoon. Then, I moved and finally moored at the pontoon close to old Mitarai. I now realized here is quiet and convenient for sightseeing and living. I got a deep sleep at night. 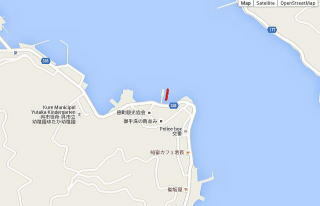 In addition, here is a well-sheltered typhoon heaven, where boats are gathering from other places. 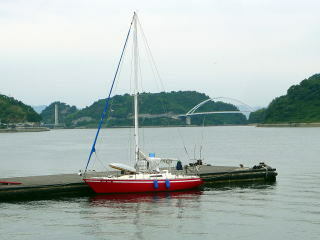 Seto Inland Sea, which is/was an important traffic route, has strong tidal currents. Before the steamship age, sailors had to wait for favorable tides at some good ports to set sail. Mitarai was one of good ports to wait. As its historical townscape remains well, it is now a good sightseeing spot.